I have to brag a bit: I called this one weeks ago. I had zero doubt that Geoffrey Zakarian would triumph in the Food Network's culinary Super Bowl to be crowned the next Iron Chef. The highly lauded New York restaurateur defeated inventive California chef Elizabeth Falkner in a fast-paced final episode of The Next Iron Chef: Super Chefs that aired Sunday Dec. 18. Well-established as a master of modern cuisine, Zakarian has become a familiar TV face as one of the rotating judges on the network's Chopped competition among other shows. He was one of eight chefs chosen for the Iron Chef cook-off, in which at least one chef was eliminated each week. From the first, Zakarian stood out for his intensity and confidence bordering on hubris. Judges as well as other contestants commented that he sometimes showed little regard for the rules. Is that Armenian, or what? Zakarian has referred to his Armenian roots on television and has been quoted in interviews reminiscing about his early years in the long-standing Armenian community of Worcester, Massachusetts. His cooking style, however, leans heavily on his classical French training and his experience with contemporary American cuisine. 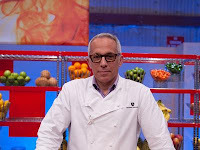 Good as he is, Zakarian was hardly a shoo-in for Iron Chef. His competition included Michael Chiarello, Alex Guarnaschelli and Anne Burrell, all familiar faces in the world of TV chefs. I knew he'd need something extra special to stand out in the final round. "He's going to make khorovatz," I predicted confidently. Sure enough, the camera showed Zakarian slicing a roast into perfect cubes — but they were already cooked and showed not a hint of coriander or sumac. I was visibly disappointed when he then tied them in little bundles instead of sliding them onto skewers. In fairness, the ingredients for his festive holiday meal were chosen by the producers: Some beef, a few candy canes, some veggies. No lamb's feet, alas, so no khash! It all turned out beautifully, however, and we'll guess it tasted even better. Chef Zakarian's reward for his hard work is the chance to be challenged again and again in Kitchen Stadium. We expect he'll do just fine. We just hope that one of these days he really skewers the competition. Congrats Mr. Zakarian! You make the Armenian community proud. You're the best!